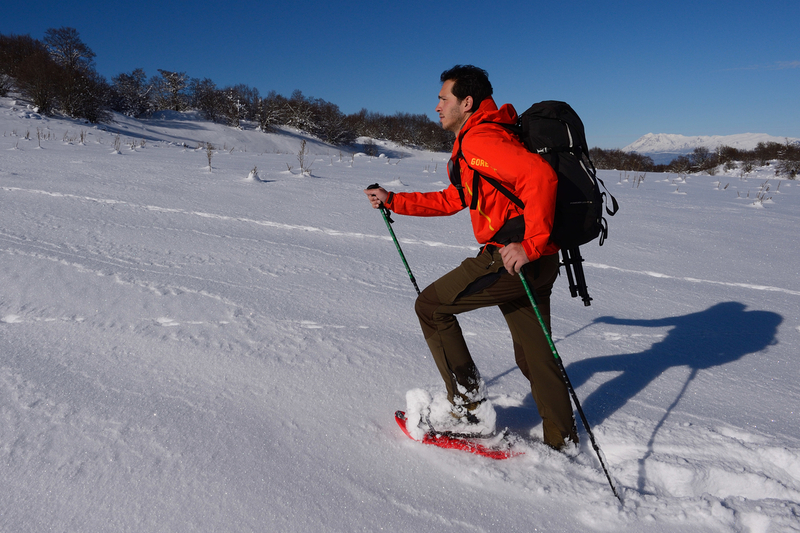 Mountain guide Umberto Esposito, Central Apennines, Italy. Wildlife Adventures is a tourism business founded in 2009 and ran by Umberto Esposito in the town of Pescasseroli, in the heart of the Abruzzo, Lazio and Molise National Park, and core of the Central Apennines rewilding area. Umberto is an experienced mountain guide and dedicated environmental educator, with a passion for wildlife photography and the conservation of the Apennine ecosytem. Therefore, he has worked closely with the National Park’s administration and the municipality of Pescasseroli. Since 2011 he manages two mountain refuges: “Prato Rosso”, a romantic hut in the middle of an old beechwood, and the stunning “Rifugio del Falco” in the Molise sector of the National Park, which can host year-round up to two dozens people. The Pescasseroli-born young man has explored the beautiful Abruzzo mountains since his childhood. A close encounter with a brown bear family some ten years ago has then shaped his life and made him take the courageous decision of becoming a professional guide in 2005. His goal is to make the world discover “his” mountains by sharing his passion and emotions and thus contribute to their protection. Wildlife Adventures, a partner of Rewilding Europe in the Apennines since the very first day, received a €2,500 loan to create a brand-new website in order to improve their marketing and help better promote their offer. The aim of the REC loan is to support “Wildlife Adventures” to increase their visibility and thus the number of tourists, to develop new nature tourism activities and enhance their direct support for rewilding activities in the Central Apennines. Wildlife Adventures offers unique tourism experiences in the Abruzzo National Park and other protected areas, providing its customers also with custom-tailored wildlife watching and photography tours, cultural and enogastronomic experiences and educational activities for children and families. The lucky winner of the July 2014 draw of the Rewilding Europe Travel Club had the chance to experience all this with the two tours generously offered by Umberto. 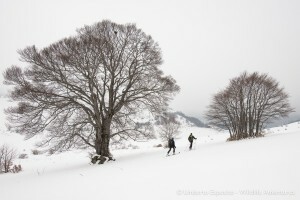 Ski touring in the beautiful Abruzzo National Park. In fact, Wildlife Adventures will very soon also be the recipient of an additional REC loan to create and manage two high-end wildlife watching and photographic hides in the rewilding area situated within the Gioia dei Marsi municipality. The hides’ design will be finalised shortly and the construction implemented in the first months of 2015. The Rewilding Apennines team will be providing the necessary know-how and an ongoing support, and with the scientific and conservation framework of the National Park, as agreed with the memorandum of understandings recently signed between the two parts. The local communities will then see a huge benefit from this, as these fantastic hides will provide with unique wildlife watching opportunities and surely attract many tourists to the area. Of course, local people will be hired for the management of the activity and maintenance of the structures and private houses in the surroundings will be renovated to create accommodation facilities. The Central Apennines, in the heart of Italy, encompass three regions: Abruzzo, Lazio and Molise. Peaks above 2,500 meters, deep valleys, ancient forests still inhabited by bears, wolves, abundant deer and chamois, surround stunning medieval villages. And all this at less than two hours from Rome and its international airport! As Umberto and his “Wildlife Adventures” are showing us, we in Rewilding Europe believe that the abundant wildlife and the pristine context of the Apennines can become the trigger for a real economical development and improved livelihoods for the people living in these mountains. You can help us save three unique Marsican bears, an endemic subspecies of the brown bear that today only exists in a small area in the Central Apennines rewilding area in Italy! Only some 50 of these bears still survive and any dead bear means a huge damage for the survival of this subspecies. We need to fund further actions to help them avoid being killed. Check out how you can help!